Whitewater rafting had always fascinated us. 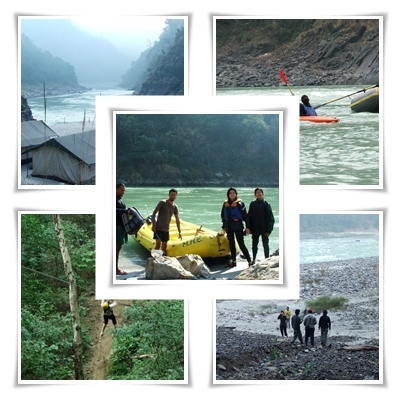 When our friend proposed a rafting trip, we quickly made arrangements with Mercury Himalayan Explorations (MHE) who ran a river rafting camp near Shivpuri, 14 Km from Rishikesh. Late evening last Thursday we caught the Delhi Metro to Chandni Chowk, crossed the underground passage to Old Delhi Railway Station and boarded a crowded and noisy Mussoorie Express to Haridwar. Next day morning, sleepless, bleary eyed and late we proceeded by taxi to the camp. The road between Rishikesh and Shivpuri was dug up for road widening which further delayed our arrival. We got our first taste of a rapid as we boarded a raft (middle oar type) to cross over to the opposite bank of the river where the camp stood perched along a stretch of sandbar below a cliff. Once ashore, we were showed to spacious, well carpeted twin bed tents. As soon as we finished breakfast, the taxi took us 11 km upstream to Marine Drive for our first rafting trip. The crew helped us into wetsuit, life jacket and helmet. Rajan, the veteran raft captain from Nepal with a scintillating smile instructed us on rafting basics. Our raft was bright yellow, NRS (“Not Really Safe” – joked Rajan) make self bailing type. Once all were comfortable with raft safety and commands (forward hard, forward easy, left back, right back, get down, stop etc) we went midstream and practiced paddling for a while before taking off. A one man safety kayak followed in our wake. Soon we hit the first rapid, ‘Investment’, a relatively tame one over which we swayed along coming to terms with rafting techniques. On the second rapid, supported on paddles, we stood up on the raft. It was exciting to feel the jerk and pull and lurch of the raft precariously balanced on the edge. Between rapids we drifted serenely along calm stretches of river, gently paddling forward, chatting and taking in the scenery. We could hear the gurgle of mountain springs. Cormorants sunned on enormous black boulders; a bird or two flitted by. There were numerous camps along the shore. At times someone shouted and our raft crew answered back. Near each rapid we braced ourselves for the wallop and paddled furiously to obtain the optimum angle of the raft to negotiate the rapid. Rajan barked commands from the rear and steered us expertly over rapids as spray fringed walls of water crashed into the raft drenching us. We closed our eyes and dug in the heels as wave after wave slammed into our faces. The rush of adrenalin, the fright and the sense of accomplishment one feels upon crossing each convulsing rapid is indescribable. At the body surfing rapid, we jumped off the raft, swallowing mouthfuls of (holy) water and clutching the raft for dear life. Once we let go off the raft, we floated down river, buoyed by the life jacket. The water was cold and scary, but the proximity of the raft and safety kayak was reassuring. Borne on the gentle current, we floated face up watching clouds, passing hills, dark menacing scree, blanched sandbanks and overhanging trees, swimming occasionally and listening to hushed ripples, sporadic bird calls and the pervasive silence of the forest. When we signaled, the crew hauled us back on the raft by our life jacket. More rapids, bearing exotic names – ‘Black Money’, ‘Crossfire’, ‘Terminator’, ‘Three Blind Mice’, left us breathless. 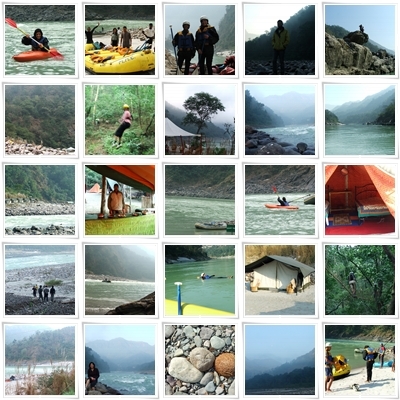 By the time we crossed ‘Back to the Sender’ and returned to the camp, we had completely forgotten the lack of sleep and exhaustion and had become die hard whitewater rafting fanatics. After lunch we did a bit of kayaking. Balancing the one man kayak with the back erect and paddling from side to side was difficult. It took a while to learn the way the kayak responded to paddling. Even with the safety raft present, it terrified us to thrust the kayak into the tail end current of the rapid. 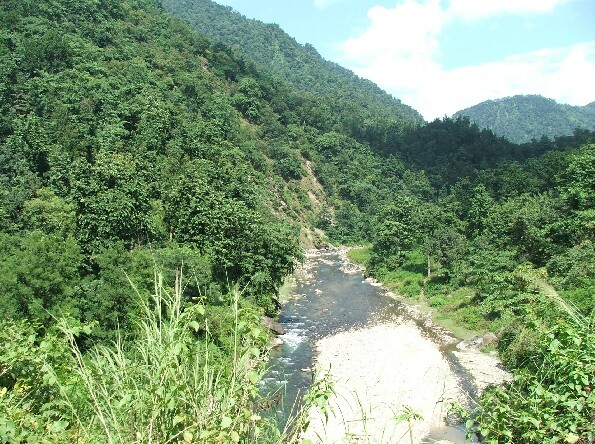 Kayaking was followed by tea and adventure activities like flying fox, valley crossing, Burma Bridge and rappelling under the constant vigil of camp staff. The evening camp fire was enlivened by snacks (chilly chicken, peanut salad and potato fingers) and rafting/ trekking stories. After dinner we came back and sat around the smoldering embers of the camp fire. The somber stillness of night was shattered by the roar of the river; shafts of vehicle headlights intermittently swept across black hills. Conversation petered out as the faint glow of stars, the scarlet radiance of hot embers and the rhythmic flow of the river threw a blanket of reflective silence over us. We found hot water bags under the blanket when we returned to the tent. Lulled by the warmth, I soon sunk into deep slumber as a few confused images of the day flashed across my mind. 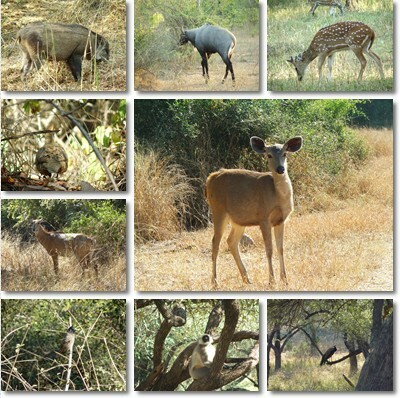 The camp site was part of Rajaji National Park. 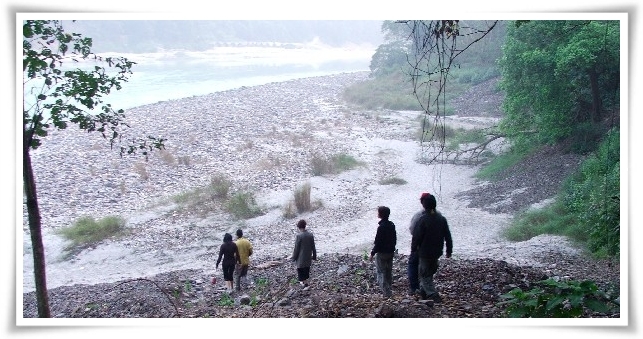 Early next morning we went for a nature walk and trekked across the surrounding hills for about 3 kms till the river bank. Curry plants dotted the trail. Occasionally we heard barking deer. Every forest has a ghost story to tell. Tanzin Angel and Surender from the camp who accompanied us on the trek showed us the house of Sikander who was murdered by villagers. His widow, unable to bear the pain committed suicide. The camp site and surrounding forest are supposedly haunted by the ghosts of this tragic couple. Thankfully the spirits were in abeyance during our visit. 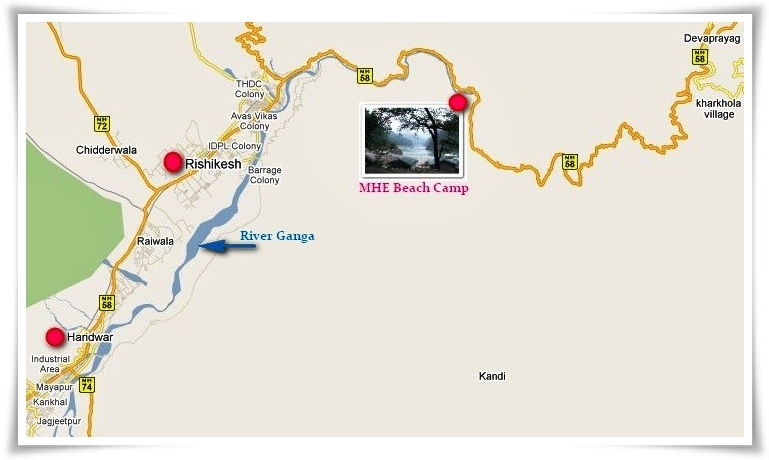 After breakfast, we rafted down from the camp to Nim Beach (near Laxman Jhulah).There were grade III and grade IV rapids in this lap – ‘Double Trouble’, ‘Roller Coaster, ‘Tee Off’, ‘Golf Course’, ‘Brahmapuri’ and many others. Our safety kayak capsized while crossing ‘Golf Course’. Fortunately, the kayak was quickly recovered and soon we were underway. At ‘Any Session Body Surfing’ rapid, we jumped off the raft and body surfed for a while. Cliff jumping was the scariest part of this adventure. I was in two minds as I stood on the cliff edge and looked down into the river. Finally, egged on by the crew, I jumped off the cliff looking straight ahead, arms close to the body and clutching the life jacket. The experience lasted only a few moments, but was sufficient for a lifetime. After lunch we bade goodbye to the camp, thanking the staff profusely for their bounteous hospitality. Back in Haridwar to catch the train! Another weary night on the crowded and filthy Mussoorie Express and we returned regretfully to our encumbered lives. The trip was a uniquely thrilling experience. The spirit of camaraderie and shared adventure was beyond comparison. 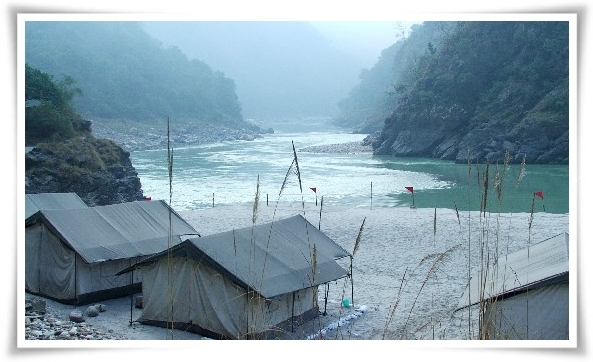 For once, Ganga, the holy river, instead of quenching our thirst left us craving for more. We were afraid that December would be too cold for rafting. Surprisingly, it turned out to be pleasant, thanks to global warming. Indiscriminate tree felling and rampant construction is taking its toll of Rishikesh as well. But we found a ray of hope in the following scene. Truly, India Shinig…. The title is an adaptation of Eric Newby’s book “Slowly Down the Ganges“. Torch – There are hurricane lamps along every path in the camp. But it is better to carry torch if you do not want to stuble and fall. Do not carry more than one bag per person. Do not carry hard suitcases. Carry only soft bags. Tanzin Angel: Currently runs a camp near Keylong with his brother. Aspires to setup his own camp at his native Lahaul in the next 6 months. 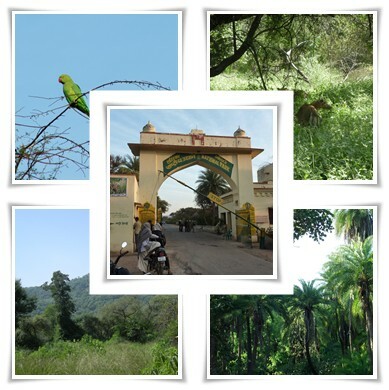 Contact details – tanzinangel_geela@yahoo.co.in. You can find him in Orkut. 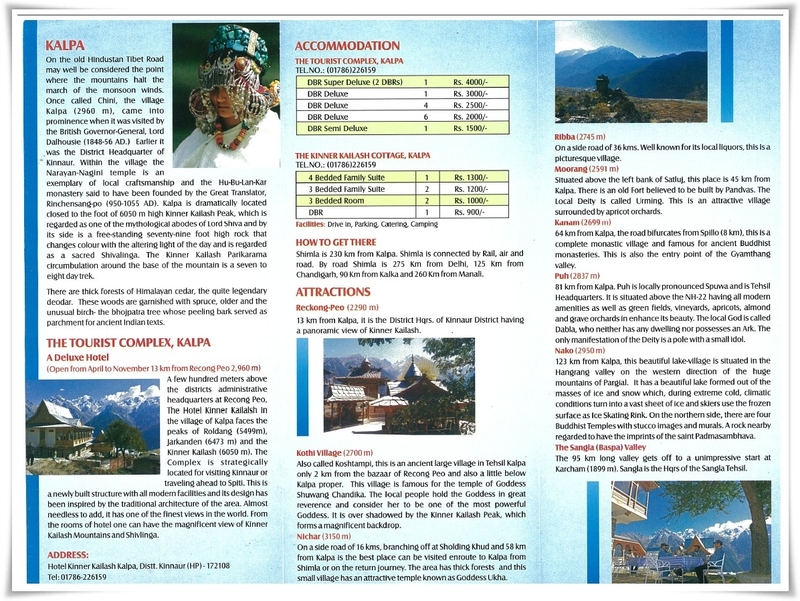 Surender: Another Lahaul native. Adventure freak. 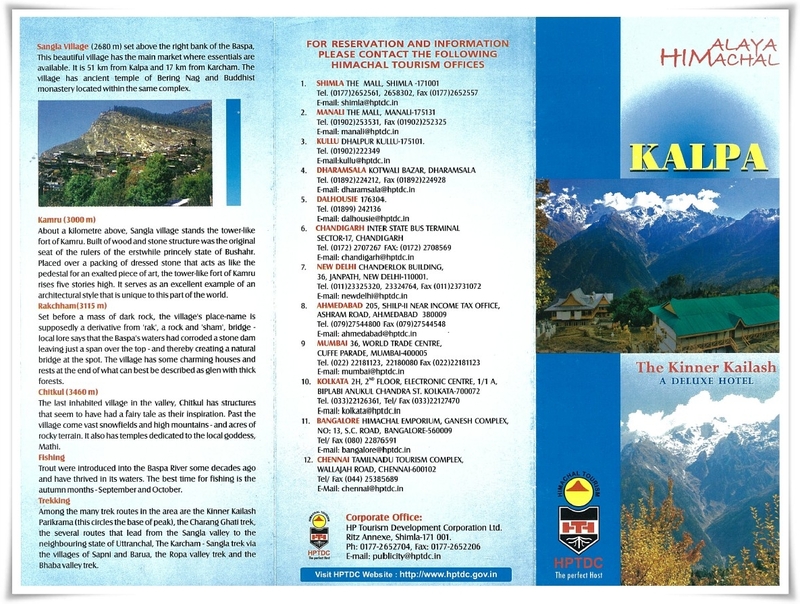 Contact details – himalayandragen@yahoo.com. You can find him in Facebook. 4041/ 4042 Mussoorie Express: We goofed up on our choice of train. Please do not take this one. It does not run on time. 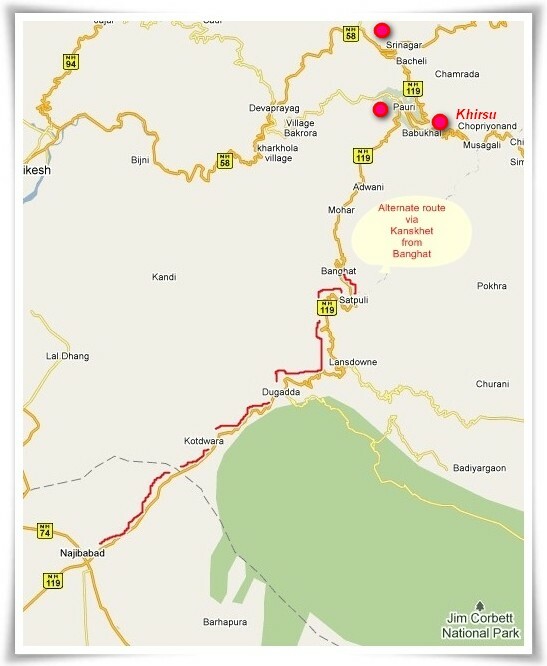 Mussoorie Express starts from Old Delhi Railway Station (Station Code – DLI). Chandni Chowk Metro Station has an underground passage which connects to the Old Delhi Railway Station. 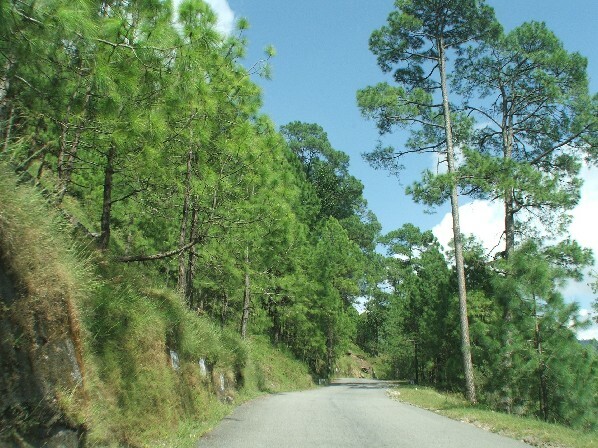 I rate the journey to Pauri as a milestone in our travel escapades. 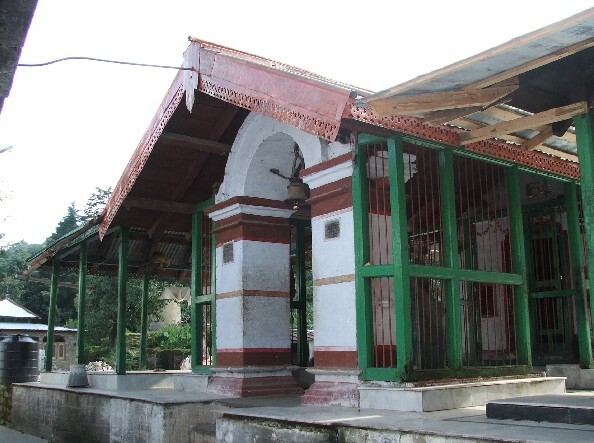 Pauri was 1814 meters above mean sea level on the slope of Kandoliya hills in the Pauri Garhwal ranges of Uttarakhand, over 400 kilometers from Gurgaon. I was deeply apprehensive about driving in the hills and my wife had a hard time allaying fears and prodding me into action. 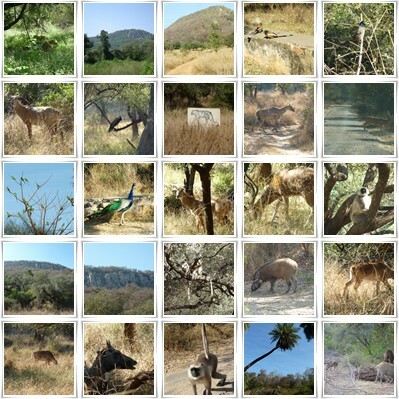 However, upon hitting the road, all fears evaporated and we thoroughly enjoyed the visit. We started off early morning from Gurgaon, touched Ghaziabad in an hour, took the meticulously hidden turn to Meerut, climbed a flyover, got on to GT Road and raced down NH58. Meerut was chaotic – pathetic roads, lumbering tractors, baffling signage. Sympathetic passersby helped us to negotiate the labyrinthine streets and guided us till Mawana/ Bijnor road. Where the road bifurcated to Muzaffarnagar and Bijnor, we stopped for tea and a quick bite at Monty Million restaurant. Beyond Bijnor, we passed several small towns, Kiratpur, Najibabad, crowded with people and cattle. 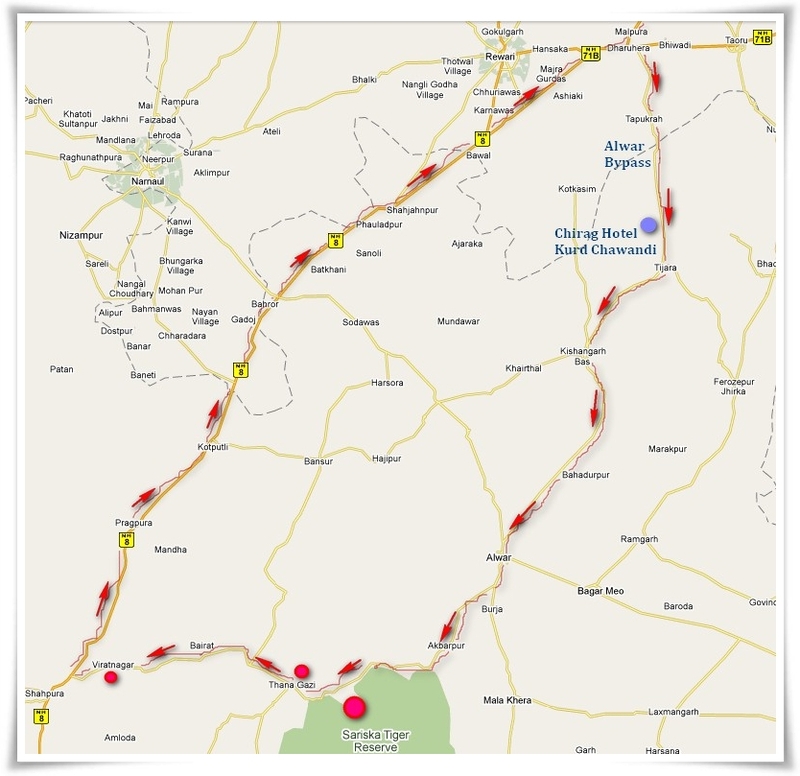 Soon the straight roads lined with paddy and maize fields gave way to winding roads. 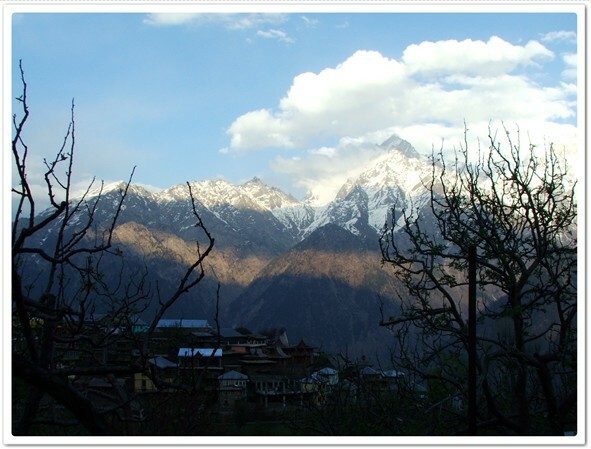 Far ahead, the Garhwal Himalayas swung into view and formed a constant back drop to the panorama. 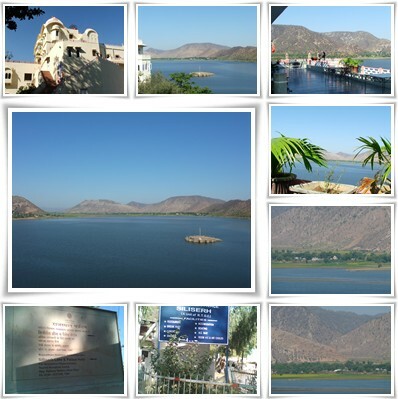 We entered Kotdwara hungry, expectant and anxious of the mountain terrain. ‘Eats’ restaurant where we lunched served us Parantha, special Dal and tea along with detailed directions for the onward journey. We filled fuel at Kotdwara and climbed along the milky white Khoh River for a while with eyes riveted to the road dodging speeding jeeps and skirting potholes. At Dugadda a branch road led to Landsdowne. 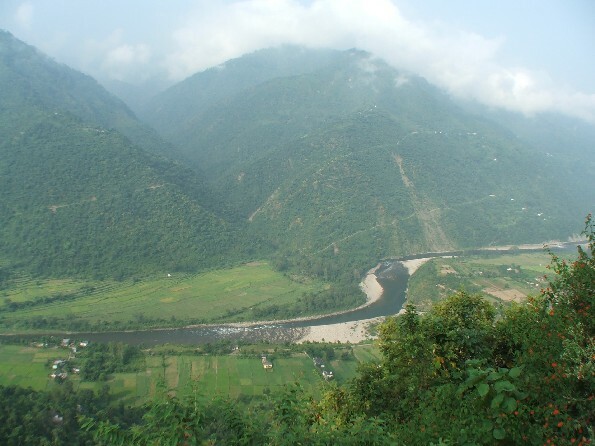 The majestic splendour Shivalik mountains unfolded over a hazy grey horizon, rolling hills and terraces of paddy as we edged past Gumkhal village and gently descended to Satpuli town. Bad news! The regular route was closed for repair. 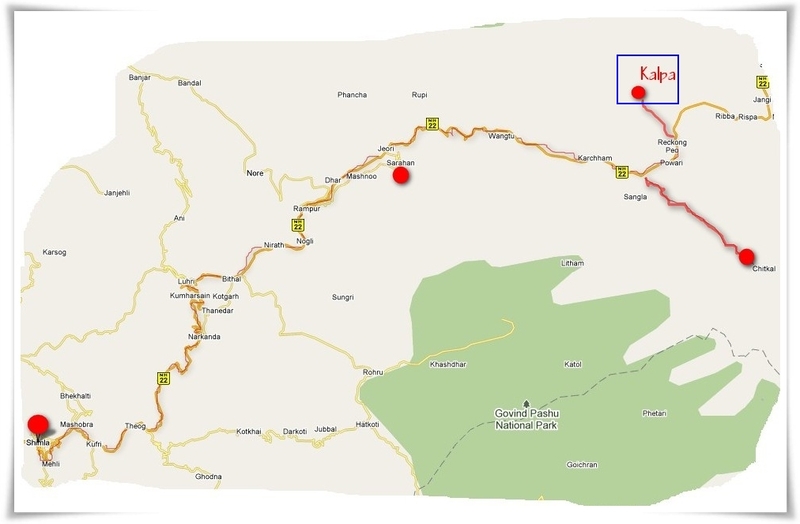 We crossed a bridge, went past the toll gate at Banghat and took the alternate route via Kanskhet. 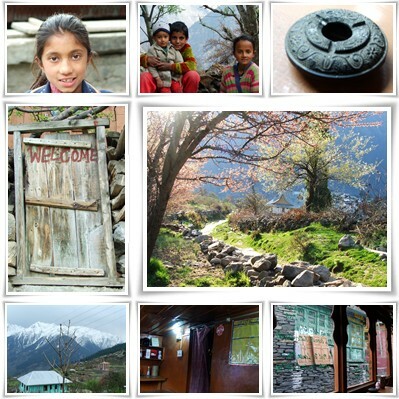 Bilkhet, Banekh, Ghandiyal, Banjkhal, went milesstones announcing roadside villages. The silver trickle of a river meandered through the valley to our left, flanked by fields in varying shades of green and yellow. Distant peaks shimmied in a play of light and shadow under the slanting afternoon sun. Evening advanced upon us sooner than expected. 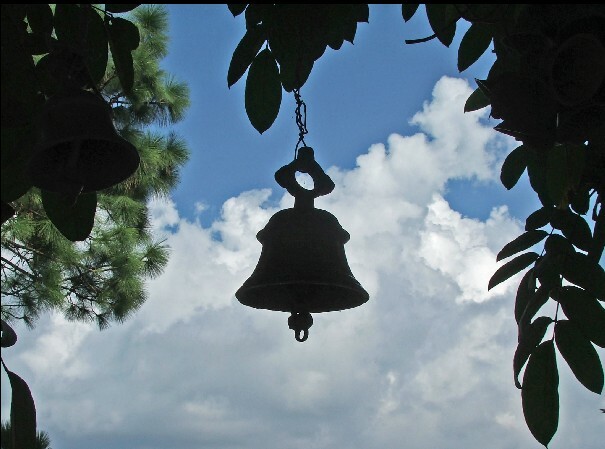 Nervous, we eagerly watched each milestone, counting the remaining distance to Pauri. As we emerged from the forest into the faint crimson afterglow of the setting sun, the town sprung upon us. 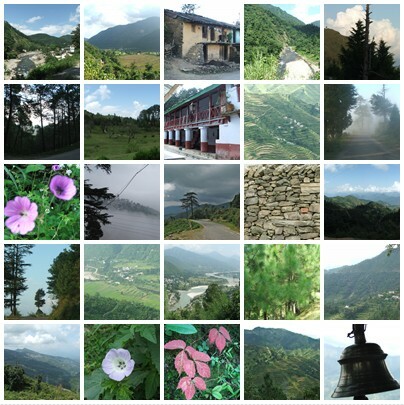 We breathed a huge sigh of relief as we reached the GMVN guest house overlooking the valley at quarter to seven. A spectacular daybreak! I lazily watched snow bound peaks of Neelkanth and Chaukhamba floating over cotton ball clouds through diaphanous curtains. The morning air was crisp, fresh, exhilarating. 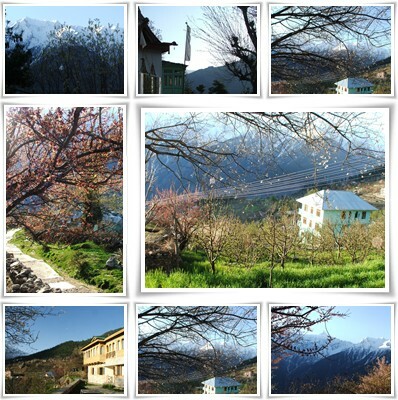 After breakfast we set out for Khirsu, driving through a breathtakingly picturesque vista of oak and deodar. After lunch we visited Kandoliya Mandir, the temple of the local mountain goddess located high-up on the mountain with amazing views of the town and valley and Kyunkaleshwar Mandir, an 8th century temple complex with splendid vernacular architecture. 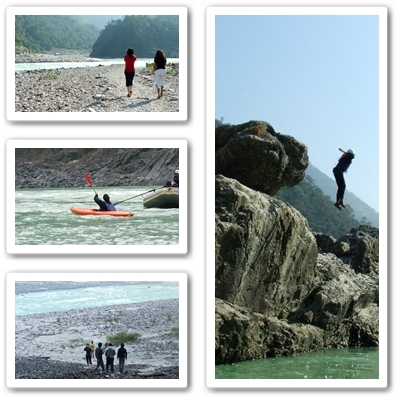 Next day, we went to Srinagar located downhill of Pauri, by the river Alakananda. Being on the pilgrim trail, the town was busy, noisy and hot. 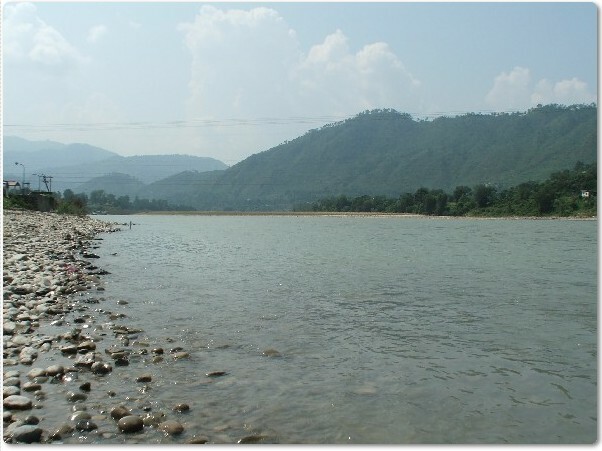 After a brief visit to the river we returned to Pauri. 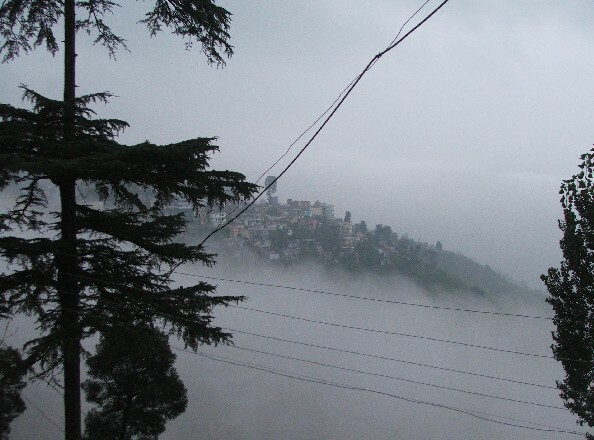 Pauri has been spared the inevitable tourist commotion and associated distractions since it doesn’t figure prominently in the tourist circuit. The forests are still pristine, unmolested by tourist litter. People are hospitable and sport a ready smile and an eager helping hand. 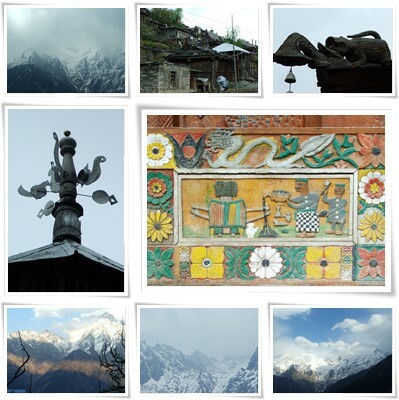 With our recollections flavoured with a sense of adventure, achievement, elation and serenity, we departed from Pauri early morning retracing the trail to our wound up, preoccupied lives.